My social media timelines are full of reflections on 2013 and resolutions for the New Year. Here in the Vicarage we’ve had some great down time since Christmas to gather our thoughts. Whilst we’ve not been sleeping or waking up feeling like we’ve been dozing in the middle of the M6, that is. There’s something about a busy run-up to the festive season that makes you feel like you’ve been run over by a few dozen lorries. On reflection, 2013 was pretty good here in the Vicarage. The kids grew up a bit and are still speaking to us (except when they’re watching telly, when it’s impossible to extract even a monosyllable from any of them). The encouragements in church outweighed the discouragements by a good margin. The clutter in our hallway has threatened but not actually managed to submerge us. I gave a Christian talk which wasn’t mainly ums and ers. I wrote a book and some people have bought it. We have seen over and over that the Lord has been faithful in the big things which concern us and the small things that bug us. As I’ve done every year for the past few, I have been going through Don Whitney’s 10 questions as I’ve reflected. I think many of the questions will be addressed in my plan to read my bible more in 2014. And I’m going to start off by following Professor Horner’s bible reading plan – a system involving reading 10 chapters a day. You can get this reading plan if you use YouBible, although one of the recommendations is to use a single bible that enables you to become familiar with the location of passages, so I’m going to start with a comfortable softbacked ESV. Obviously this is pretty ambitious and I’m sure I’ll stumble along the way. But I want to see if I can read at the pace I normally read a work of fiction – gathering general ideas and making links, not getting bogged down in the detail. One of the hazards of too much social media consumption is the tendency to skim lots in short chunks and not sit down to read and reflect. This is what I’d like to work on this year. I want to know God through his word and be filled with thoughts of him. Dave Bish offers a similar approach in a blogpost from 2012. 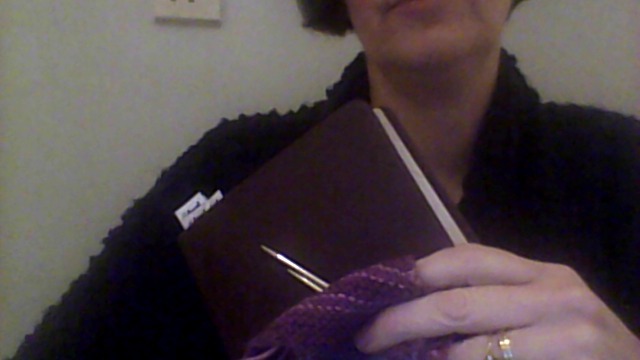 My other main resolution for 2014 is to knit more. And do crafty things in general. One of the things about living in a busy Vicarage, where home is the workplace and work is in the home, is that it never quite feels like everything is finished for the day. So I usually feel guilty (to a greater or lesser extent) about sitting down to anything that’s not *really* needing to be done. Telly and the internet don’t seem quite as deliberate as taking up the knitting needles or sitting down at the table with craft equipment. But relaxing creatively is good for me. It makes me feel refreshed and there is something there at the end which makes me smile. So I have a scarf pattern, and I have taken up my knitting needles again. And the Queen has got herself a PInterest board and I am planning to join her in having a craftier 2014. Do you have grand (or small) plans for 2014? You might like to take advantage of the free download offered by Christian Audio this month – the entire ESV bible on mp3. And if you have an Apple device, you can now download PrayerMate for free until the end of March courtesy of London City Mission. I’ve got to hang out for the Android version… If it makes a difference just for a bit, it’s worth a go. If it’s worth doing, it’s worth doing badly. My granny was a fantastic knitter, but I only decided recently that I wanted to try my hand with needles and wool. My helpful mother-in-law gave me a knitting book for Christmas and this is one of the results – a gift for a friend’s 40th birthday. I’ve been meaning to post this for a while… I suspect most of my huge array of readers will have seen either the bag or the pictures before. But just in case you haven’t…. Thanks to Louisa Harding for the pattern from her accessories book.